You first notice the problem by spotting a damp spot on the wall or ceiling followed shortly by swelling of the paint or ceiling board. This is a good indication of a leak somewhere, usually the geyser or a leaky pipe, ask any plumber. Should you find the leak at a joint in the leaky pipe, simply tighten the joint. If the leak is in the pipe itself, remove that section of the pipe and replace it with a new one – which can be a bit tricky if you are not a qualified plumber. We are 24 hour qualified plumbers, give us a call and we will gladly assist you with your plumbing problems. Start by turning off the water supply to your property. If you need a quick fix though, until a real plumber can have a look at it, you can try patching the leaky pipe. Most hardware stores stock plumbing patch kits to fix your leaky pipe problem. Alternatively, as a temporary solution, you could wrap waterproof tape over the leaking spot (just be sure that the pipe is dry before your start wrapping the tape over the leak in the pipe). DO: Use a bucket or one of your household pots under the spot where the dampness or wet bulge is in your ceiling before you start poking at it. DO: Take in mind that waterproof tape and tightening joints are temporary solutions. Call a professional plumber to assess the problem. Should this little plumbing surprise arise on a public holiday or after hours, don’t worry – we are 24 hour plumbers. DO: Break or puncture the affected area with a sharp object like a knife or screwdriver so the gathered water can be released safely into a bucket and not your furniture. DON’T: Do not think if you found one leak and you patched it, the problem is solved. 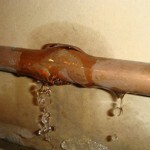 Old corroded pipes usually spring another leak as soon as the original one is covered. It is best to replace the pipe. 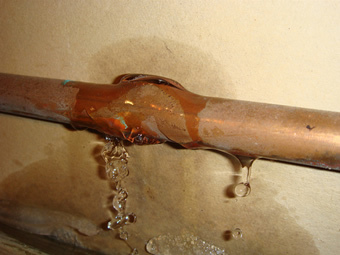 DON’T: If you do aren’t too sure about your soldering skills, now is not the time to test your own abilities trying to solder the copper pipes in your plumbing system. 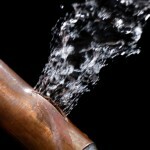 Leaky pipes can be a big headache to any homeowner and one that needs fast action. 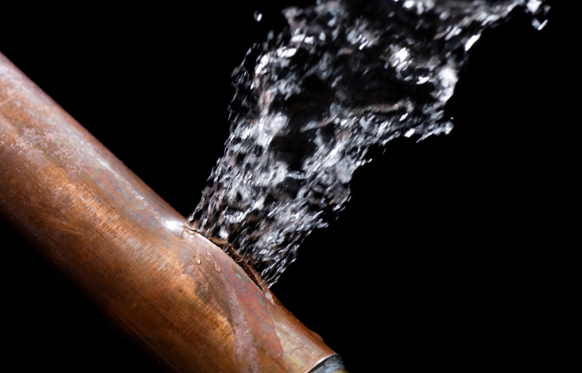 We at Plumb 247 are skilled 24 hour plumbers, ready to fix the leaks in your pipes. Call us today!